Shalom Shalom L’Kulam (as they say)! It’s been a super busy and exciting week and aydat (unit) Gurim has shone in every way possible as per usual. 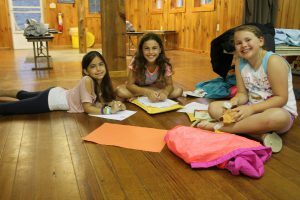 We last checked in on the blog as our annual camp-wide lip syncing competition, KTV, was fast approaching. Gurim absolutely swept the evening with wins for Lower Camp. Our bunks placed: G3 came in third with a basketball-themed song and B7 came in second place lip syncing along to a song from Frozen. The camp was blown away by each of our performances, but we were happy to take a little recognition from the judges, as well. Our week finally calmed down on Tuesday and Wednesday with some normal mornings and afternoons which meant sports, swimming, and learning our dances for the camp-wide Rekudia (dance performance). On Thursday, we all boarded a bus and drove to beautiful Whit e Lake, which is somewhere in beautiful New Hampshire. We spent the day playing in the water while violet mountains peaked from behind clouds in the distance. We stayed for as long as we could before the clouds darkened and started to drizzle down rain. Just as Shannon, our trusty bus driver closed the door behind us, the thunder clapped and the rain poured. We had left just in time and returned to camp sleepy and satisfied. Although we were tired from our full day of playing and swimming, we still enjoyed our evening activities. The banim (boys) participated in an awesome obstacle course complete with crawling, jumping, and running. The banot (girls) split up into bunks: G3 had erev Invention (Invention Night) and G6 had erev dayag (Fishing Night). Both evenings were SO SO FUN. Now we are gearing up for Shabbat and of all of the spirituality and special-ness that comes with it. CAN YOU FEEL THE LOVE??? TU B’AV SAMEACH AHUVIM SHELANU (Happy Tu B’Av (Jewish Valentine’s Day) to our loves!)!! !